Canadian Financial DIY points out the irony of using a stock-picking contest to raise money for financial literacy. Real financial knowledge for most investors begins with understanding the futility of trying to pick your own stocks. Million Dollar Journey has a tip for extending the life of your hot water heater. Potato makes an interesting case for treating investing as one of your careers. Squawkfox explains how to get the most from the customer service of a large company. She includes an audio recording of a successful call she made. I agree with all her points, but I think a fair measure of her success on that call came from the man answering the phone perceiving her tone as somewhat flirtatious. There’s nothing wrong with that, but it certainly wouldn’t work as well for most of us. The Blunt Bean Counter looks at the economics of illegal tax avoidance resulting from cash payments to contractors. Big Cajun Man says that if you’re bad with your money banks will love you. My Own Advisor makes his pick of the top bond ETFs. I’m not a bond investor myself, but he made some picks that keep costs (MERs) down, which is important. With a league minimum salary of $375,000 in 2011, it’s painfully obvious to me that saving only 20% of income is far too low. And this was achieved by only 48% of players who participated in a program. Further, this was only achieved with the threat of a lockout. To demonstrate that 20% is too low a saving rate, I did a few calculations (surprise!). Let’s assume that players want to smooth their spending evenly over their remaining lifetimes (adjusted for inflation) and conservatively assume this may be 70 years. Further, let’s assume that their incomes after retirement with be insignificant compared to their pay as players. As you can see, it never makes sense for an athlete to save less than 40% of income. More realistically, if they don’t count on playing for more than 5 years, they should be saving over 80% of their take-home pay. This contrasts sharply with a saving rate of 20% for only a minority of players. It’s probably difficult for great athletes who have dominated opponents for most of their lives to accept that they won’t be able to succeed at some other money-making venture after they retire. I wish the NFL Players Association good luck in convincing its members to save more of their incomes. I find the stories of destitute players quite sad. I’d be willing to try to help in some way, but be forewarned: I’m a terrible salesman and wouldn’t bother trying to line my own pockets by stroking player egos and offering them “exclusive” investments. The solution is a high saving rate, no debt, and boring index investing. In 1738, Daniel Bernoulli devised a simple model of risk aversion (English translation here). Nobel Prize winner and author of Thinking Fast and Slow Daniel Kahneman criticizes Bernoulli’s theory extensively, describing it as “Bernoulli’s Error.” I disagree with Kahneman. I think Kahneman misunderstands Bernoulli’s claims. Bernoulli’s theory of decision-making is best described with some examples. He claims that doubling your net worth is as positive as dividing it by 2 is negative. So, if your net worth is $200,000, receiving another $200,000 is as positive as losing $100,000 is negative. Kahneman’s extensive research has shown that people don’t think this way. They tend to be more risk-averse than Bernoulli’s model indicates. When trying to avoid losses, people tend to be more risk-seeking than Bernoulli’s model. Across several pages in Thinking Fast and Slow that Kahneman devotes to criticizing Bernoulli’s theory, the argument seems to boil down to the fact that people don’t make decisions consistent with Bernoulli’s model. I agree with this. However, after reading Bernoulli’s paper, I see no evidence that Bernoulli was trying to model human behaviour. He was trying to model rational behaviour. In section 7, Bernoulli looks at how much people “should be willing to venture,” not how much they are willing to venture. In section 14, he says that anyone who accepts a certain type of gamble “acts irrationally.” In section 15, he says that offering certain types of insurance is “foolish” and “unwise.” It seems clear that Bernoulli was not trying to model actual decision-making; he was modeling rational decision-making. Some may think that we should make decisions about gambles based on simple mathematical expectation. So, if you’re offered a chance to either win $10,000 or lose $9999.99 on the flip of a coin, it is rational to accept. This is incorrect. We can see this if we take it to the extreme. Imagine you’re given a chance to gamble for everything you own: double (plus a dollar) or nothing. This is a bad bet. The misery you’d face in your future if you lost far exceeds to benefit you’d get if you won. A certain amount of risk-aversion is perfectly rational, and Bernoulli sought a rule to decide which risks are rational to accept. It’s quite true that Bernoulli’s model has its challenges. It will fail in some narrow circumstances such as desperately needing money for a life-saving operation. Another challenge is deciding what counts in your net worth. How do you model future income (human capital)? How do bankruptcy laws factor in? Despite these challenges, I’ve found Bernoulli’s theory to be an excellent model of rational behaviour. I’ve learned from Kahneman’s research that Prospect Theory is an excellent model of the way people actually make decisions. Faced with a chance to make $300 or lose $200 on the flip of a coin, Prospect Theory explains why people turn down this gamble, and Bernoulli explains why it is rational to accept the gamble. Any tension between the two theories is easily explained by the fact that people are sometimes irrational. Canadian Couch Potato explains why a new ETF based on strip bonds is tax-efficient for fixed-income investors using taxable accounts. The Blunt Bean Counter thinks that both investors and their advisors are to blame for TFSA over-contributions. Big Cajun Man says you shouldn’t make big financial decisions late in the day, and that people who try to sell you big-ticket items know you’re less likely to buy the next morning. My Own Advisor explains why he’s not interested in trading futures. Passive investing using low-cost index ETFs and mutual funds is rising in popularity. The number of investors who are excited by the idea of couch potato investing is growing every day. However, in a recent conversation I had with Canadian Capitalist, he observed that enthusiastic couch potatoes usually don’t really invest passively. Sadly, I have to agree. Let me start by admitting my own transgressions. It took me many years as a stock-picker before I finally decided that I was better off investing passively. Even then I took my sweet time selling off individual stocks and buying low-cost broadly-diversified ETFs. I still hold one individual stock (Berkshire Hathaway) for less than 10% of my portfolio. I don’t intend to ever buy more Berkshire, but this is still a deviation from index investing. So, I’m not a pure passive investor. But, even if we adopt fairly lax standards for what constitutes passive index investing, few self-described couch potatoes meet the test. Following are 3 categories of not-really-passive investors that I’ve seen. These investors have most of their savings invested passively, but keep 10% or 20% in a side account to scratch their stock-picking itch. The trouble is that in this smaller account their annual stock turnover might be 100%, 300%, or more. This frequent trading usually leads to losses, and replenishing side accounts takes savings away from the passive part of their portfolios. The idea of collecting fat dividend cheques is irresistible to some investors. Fortunately, most dividend investors hold their stocks for long periods. They usually suffer from too much stock concentration, but adding some dividend stocks on the side of a passive portfolio is likely to be the least damaging of the three types of not-really couch potato investors described here. I’m always baffled when an investor listens to my short pitch for passive investing and responds with something like “I love couch potato investing. I’ve been doing it for a couple of years. Do you think the stock market is overvalued right now? I sold out of XIU and VTI a few months ago, but I’m wondering whether now is the time to get back in.” These people just won’t believe me when I say I have no idea where the market is headed in the short term. They are very far from being couch potatoes and their long-term returns are very likely to fall a long way short of market returns. On average, any deviation from pure passive investing is likely to lose money. There will always be those who manage to beat the market, but more will lose to the market. Reading a review of Qtrade at Money Smarts, I was struck by the description of the foreign exchange fees as “pretty good”. They may compare favourably to foreign exchange fees at other discount brokerages, but compared to a reasonable fee, they are horrendous. For amounts over $25,000, Qtrade charges 0.96%. This is $240 on $25,000. What is there to justify such a high cost? I can understand the need to recover costs when handling actual cash. It costs money to pay employees to give out cash, and you have to take on currency risk for days to hold onto cash. However, these costs don’t apply to electronic transactions. A simple fee of $10 plus 0.1% for electronic conversions among major currencies would leave plenty of profit margin for banks and brokerages. This corresponds to $35 on $25,000. I understand that businesses seek profits and will charge what the market will bear, but it is time that investors demanded more reasonable foreign exchange fees. 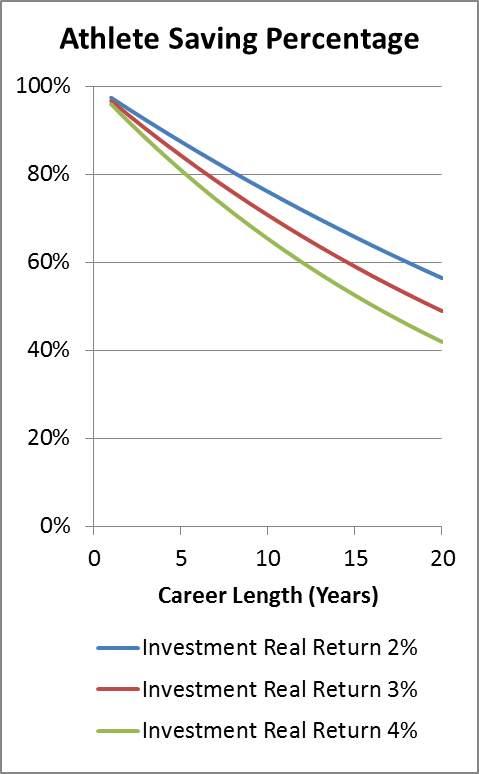 A heuristic I’ve heard about a few times is that you should have 12 times your gross salary saved before you retire. I’ve always had a vague feeling of uneasiness about this rule of thumb, but the problem with it never hit home with me until I started thinking about a raise I’m expecting soon. Suppose I currently have retirement savings equal to 11 times my salary. I’m close to being able to retire by the 12 times salary heuristic. Suddenly, through no fault of my own, I get a 10% raise. Now my retirement savings are only 10 times my salary. My retirement dream is slipping away. I probably have to work an extra year or two and pray I don’t get any more raises. This is crazy. The ratio of savings to salary just makes no sense for me. I should be calculating the ratio of my savings to my yearly spending instead. Focusing on this spending-based ratio means that raises are a good thing because they allow me to build my savings faster. It may be that the savings to salary ratio makes sense for people who automatically increase their spending to match any pay increases, but that doesn’t apply to my family. My raises have no noticeable effect on my family’s spending. I’m going to delete the cell in my savings spreadsheet that calculates my savings to salary ratio.